Select the nine-piece gift† of your choice valued at up to $271* when you spend $70 or more^ on Elizabeth Arden. Prevage Gift Choice valued at $271* includes: Prevage Day Ultra Protection Anti-Aging Moisturizer with sunscreens 5ml, Prevage Eye Anti-Aging Moisturizing Treatment 5ml, Prevage Anti-Aging Night Cream 7ml. Ceramide Gift Choice valued at $229* includes: Ceramide Plump Perfect Ultra Lift & Firm Moisture Cream with sunscreens 7.5ml, Ceramide Gold Ultra Restorative Capsules for Face 7 pieces, Ceramide Moisture Network Night Cream 7ml. Intervene Gift Choice valued at $212* includes: Intervene Radiance Boosting Moisture Cream SPF15 7ml, Intervene Timefighting Radiance Serum 4.5ml, Intervene Stress Recovery Night Cream 7ml. Each choice includes the following make-up essentials: Ceramide Plump Perfect Lipstick in Perfect Cinnamon 4g, Pretty Eau de Parfum Spray 10ml, Ceramide Lash Extending Treatment Mascara in Black 3g, Deluxe Compact including 2 Eyeshadows, 2 Lip Glosses and 1 Cheek Colour, All Gone Eye & Lip Make-up Remover 50ml and a stylish black cosmetic bag (pictured in main shot with Prevage Gift Choice). 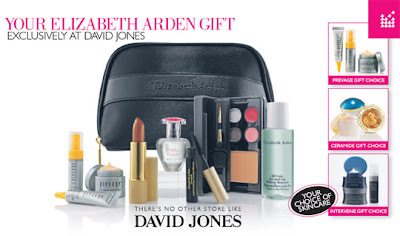 For Elizabeth Arden, there’s no other store like David Jones. Available until Sunday 13/06/10 or while stocks last.